Send me an email at amanda@homesongblog.com saying hello and that you’d like to join our book club. I will add you to the list at the start of our next read. Hope aboard the rich discussions every other week on this journal. 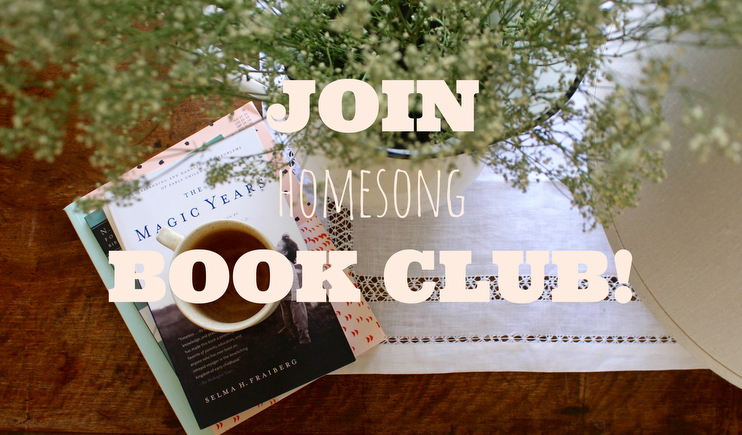 Tag #homesongbookclub as you read and share! Homesong is starting a book club lunching March 20th – the first day of spring! I am so excited to jump into this new project with you as we feed our souls together and deepen this community through the power and beauty we find in books. I am a long-time lover of reading, and the way Anne Lamott expressed the value of spending time with one’s nose in-between pages speaks volumes to me. I know we cannot gather around a coffee table full of good food and wine in my home, fire rolling and laps covered in blankets as we discuss our current read, but we can do something of sorts here in this space. We can gather. We can read. We can share. We can grow – together. Each one of us comes from a vast landscape of different experiences and has a unique story to share as we explore themes relating to love, family, faith, grit, spirit, courage and hope. I hope you’ll join, either as an active participant or as a quiet contemplator, but if anything, feel more encouraged and inspired to read in your home. How is this book club going to be organized? Because we do things seasonally here, that is the measuring stick we are going to use. Each spring, summer, autumn, and winter we will choose 3-4 books to read, one from each of the categories listed below. Some of the books I have laid out for you to chose from are much longer than others, some rather short, so we will aim for 900 pages per season, which puts us at roughly 10 pages a day. That will be your goal: 10 pages a day. You can do it. I believe in you! We will keep on another accountable and we will share our reading experiences as our book unfolds. If you want to read ahead, go for it! If you want to keep a steady pace, that’s fine too. This book club is not a race, nor is it designed to stretch you too to the point of discomfort. You should feel a bit of a pull though, this means you’re growing. I also highly recommend you purchase a hard copy to have in your hands. I know many who disagree with me on this, but I happen to think writing in our books is wonderful thing to do while reading. Scribble away when you feel inspired – underline your favorite quotes and star beautiful prose to share back when we meet up. I want to know what gems you’ve uncovered and what treasures you’ve dug up between the pages. This is what makes a book club so special – the sharing. The connection. And lastly, I welcome you as you are. I welcome you whatever season of life you are currently in. I am a mom, I am busy like you, and I want to read more. I want to sink into writing that makes me feel more less alone and more understood. I want to learn more about life from those who are living it differently than I, and I crave this escape to get to know myself better in the process. I believe a well-lived life is lived in the details, so let’s surround ourselves with heaps and heaps of them, shall we? Well hi. 👋🏻 I’m Shayla, mama to two girls (4 & 1), going to school for herbalism, slowly trying to rid our house of plastics and on a journey to becoming (slowly) a no waste home. My favorite books are the kind that make you believe in magic. Anything by Sarah Addiaon Allen is ok in my book, though Garden Spells is my all time favorite. Honestly, any of these titles sound wonderful to me! I’m in regardless of choice. If I had to pick the three that stand out to me most, I’ll pick: “a homemade life” , “The book of SHE”, and “the hidden life of trees”. I’m really excited about this new opportunity. I am from Cincinnati, OH and love the book suggestions you have made so far! I love writing and journaling about the books I’m reading and tend to read A LOT of books at one time. I just surround myself with oodles of titles and pick up whatever calls to me on any given day. I am a Montessori teacher and love to read about anything that will help me live a conscious, well-led life, and be a conscious, well-loving spouse/parent. Parenthood + Homemaking: *Simplicity Parenting; No-Drama Discipline; Tender at the Bone. I’ve started reading Heaven on Earth (Sharifa Oppenheimer) and want to finish it this year. Creativity + the Art of Wholesome Living: Hope in the Dark; The Book of She, *The Abundance. I’d also like to finish Big Magic (Elizabeth Gilbert) this year. Spirit + Nature: The Broken Way; *H is for Hawk; The Hidden Life of Trees. I would love to finish Autobiography of a Yogi (Paramahansa Yogananda) this year. I love the journal prompt aspect to this idea and I also would be interested in talking about the readings in a small group or even one on one. I hope to learn a lot and potentially meet some really sweet, interesting people along the way. YAY! I am so excited about this. Anyways, Hi! I’m Katelin. I am a wife and a stay at home mama birdie to one little sunshine boy Rowan Psalms (13 mo) in Michigan. I love to read a variety of things. Being a new mama I have currently been gobbling up all sorts of parenting books, and soul books because Lord knows my new mama heart needs it! I would love check ins and an open forum discussion! Hi there! I’m excited to participate with you all.. I just love your Homesong blog. I’m fully in the “I have small children taking over my life” season (Is that a thing? Lol) and my brain is turning to mush. -spirit and nature: *the broken life, upstream and the hidden life of trees. And my added title is Buddhism for mothers by Sarah nepthali. Oh, I am so excited about this. I have such a hard time finding time (maybe lacking discipline) to sit and read. Even though I have a mountain of books I want to read. So, I am a stay at home momma to my two little girls: Eden (almost 3) and Evie (4 months). But, outside of that role I love playing music and singing, writing, and conversations that can go deep. Intellectual discussions? 😉 I love reading non-fiction and books that focus on personal growth or that really make me pause and think. Anyways! *Simplicity Parenting, No Drama Discipline, and A Homemade Life. My 1 book: Parenting by Paul David Tripp. *The Abundance, The Power of She, Hope in the Dark. Hi! I’m a first time mom and my daughter is almost 5 months old now. I’m back to work a couple days a week and am now trying to find room for “me time” as my partner and I get a routine going. I miss reading and have been on a strict audiobook and NPR diet these days. I love fiction but am craving informative non-fiction; these categories you have chosen are exactly what I am looking for! I’m excited to learn and participate in something like this with so many moms and like-minded women. Thanks for extendeding so much inclusion in this venture. My contribution is The Montessori Method by Maria Montessori because I am interested in finding a childhood education method that suits our family best and I don’t know enough about the specifics of Montessori education. Also I’ve had this book for like 9 months and still haven’t started it! Hi there! Liz from California, stay at home mom to two wild girls who will be 5 and 1 in two weeks (same birthday!) Honestly, I haven’t read much since my youngest was born. I’ve been bad about carving out time for myself (what’s that?! ), and this sounds like a delightful way to do that! I usually gravitate toward non-fiction books that connect me with my inner child, help me to see the good in people, and give me a sense of hope in this scary world because sometimes my anxiety and my pessimistic nature take me to a dark place. My top three in each category: tender at the bone*, simplicity parenting, no drama discipline // the lonely city*, the book of she, hope in the dark // the broken way*, the hidden life of trees, upstream. I just got The Danish Way of Parenting and it’s next on my to-read list. I love the idea of journal prompts. Open forum discussions would be great too. Something I could set aside time for at the end of a long day. I haven’t been very nurturing of myself since becoming a mother, and this would be a great way to reconnect with myself and the things that used to light a fire in me. I also love the idea of connecting with other moms…I’m a total introvert, so I don’t really get out and get involved with traditional mom’s groups. Hello! My name is Gina and I am a librarian from the Illinois prairies. I love cooking, singing and reading. I tend to read intense thrillers or literary fiction (I just recently finished Lincoln in the Bardo and loved it!). I love the Spilled Milk podcast and would love some motivation to push Molly’s memoir to the top of my too read list (plus I love reading about food). Also, Annie Dillard is one of my favorite authors and Pilgrim at Tinker Creek is my favorite book so I would love to read Abundance! Of these book choices, my faves are *No Drama Discipline (I love The Whole Brained Child); Simplicity Parenting; and I’d add either of Janet Lansbury’s parenting books – Elevating Childcare or No Bad Child (she also has an excellent podcast called “Unruffled”). Next up: *The Abundance — Looks so good! Her writing is gorgeous. Then: *The Hidden Life of Trees; The Broken Way; Upstream. Hello! On a recent OnBeing podcast Elizabeth Gilbert talks about leaning into your curiosity – instead of your passion. I think this book club could be just that for me. 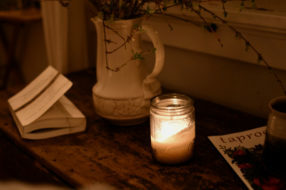 I am so curious about all there is yet to discover and the idea of connecting with others over shared books sounds like just what I need in this season of life. I’m home part time with my two year old son and also do communications/marketing work for a radio program featuring sacred choral music … and I do a little freelance writing when I can. I live in Minnesota and find inspiration in the changing seasons (even our harsh winters!) and beautiful landscapes, but am originally from New Jersey so have a little east coast in me too! I love reading anything that makes me pause and grab a pen to make notes. I love learning! I’m Kali, mama to sweet Emmett (14 months), wife to a third-generation Oregon berry farmer, and book nerd from way back. I’m so excited about this! Thanks for taking the time to put it together and sharing some of your favorite books. I read Simplicity Parenting (at your recommendation) in the early months of my son’s life and it was so inspirational and such perfect timing. So much of my parenting style has been built from that book and I’m so grateful you shared it! I read A Homemade Life on an airplane a few years ago and remember sobbing right there in my seat reading the chapter where she loses her father. It’s such a beautiful book and really spoke to my soul. I actually met Molly at her restaurant that year too, and totally gushed all over her about how much that book meant to me. AN EVERLASTING MEAL: COOKING WITH ECONOMY AND GRACE by Tamar Adler | 272 pgs. TENDER AT THE BONE: GROWING UP AT THE TABLE by Ruth Reichl | 320 pgs. THE LONELY CITY: ADVENTURES IN THE ART OF BEING ALONE by Olivia Laing | 336 pgs. THE VIEW FROM THE CHEAP SEATS by Neil Gaiman | 544 pgs. *THE BOOK OF SHE: YOUR HEROINE’S JOURNEY INTO THE HEART OF FEMININE POWER by Sara Avant Stover | 320 pgs. THE ABUNDANCE: NARRATIVE ESSAYS OLD & NEW by Annie Dillard | 304 pgs. *UPSTREAM by Mary Oliver | 178 pgs. THE HIDDEN LIFE OF TREES: WHAT THEY FEEL, HOW THEY COMMUNICATE—DISCOVERIES FROM A SECRET WORLD by Peter Wohlleben | 288 pgs. ON THE MOVE: A LIFE by Oliver Sacks | 416 pgs. I’m hoping to find a sense of community by participating in this club, as well as the external motivation to make time to read something other than a cookbook, Montessori learning or parenting book. I think journal questions and a discussion board would be great! Hello! I’m Danielle, momma to Bridgette 3 & Benjamin 1. I enjoy making my house a home, gardening and cooking. I’m looking for meaningful conversation & thoughts. * A Homemade Life: Stories and recipes from My Kitchen Table by Molly Wizenberg | 352 pgs. * The Lonely City: Adventures in the Art of Being Alone by Olivia Laing | 336 pgs. * Upstream by Mary Oliver | 178 pgs. * The Hidden Life of Trees: What They Feel, How They Communicate—Discoveries from a Secret World by Peter Wohlleben | 288 pgs. And I forgot part 1! Oops! My name is Melissa and I am a full time SAHM to three daughters ages 6, 3, and 1. I'm a writer, blogger, and self-published YA novelist. I read everything from Gillian Flynn to Stieg Larsson to John Green and am trying to get back into the classics like Bronte and Dickens. I love to read books so engrossing I finish it in one sitting. Nothing grabs my attention better than a good love story with beautifully flawed characters. Me Before You is a great example. **No-Drama Discipline: The Whole-Brain Way to Calm the Chaos and Nurture Your Child’s Development by Daniel J. Siegel | 288 pgs. An Everlasting Meal: Cooking with Economy and Grace by Tamar Adler | 272 pgs..
A Homemade Life: Stories and recipes from My Kitchen Table by Molly Wizenberg | 352 pgs. Hope in the Dark: Untold Histories, Wild Possibilities by Rebecca Solnit | 184 pgs. **The View from the Cheap Seats by Neil Gaiman | 544 pgs. **The Broken Way: A Daring Path into the Abundant Life by Ann Voskamp | 288 pgs. Upstream by Mary Oliver | 178 pgs. I recently read Raising an Original and felt like it was amazing for the ages of my children and my personal goals as a mom. I have been wanting to join a book club and this opportunity came at such a perfect time! I am a second year in college, leading a bible study, loving the lord, outdoors and working in a cute and cheerful coffee shop. I love to read books of any and all sorts. historical fiction, magic, mystery, true stories, anything that will make me laugh or cry preferably! Jesus, trees, and wind feed my soul. Along with holistic health, journaling and drinking tea. Recommendation: Chasing Slow by Erin Loechner! Hello ladies! My name is Brandi I am a soon to be college grad, actually a lit/education major. I don’t have any kids but already have a huge passion for childbirth, homemaking, and parenting/teaching. I am in a couple other online bookclubs but they aren’t super interactive so I’d love to be apart of this community! These are my top books! My name is Mindy Culmore and I stay home mom in Seattle, WA with my son (2) and daughter (4). I love reading books about spirituality, bringing up children, cooking, romance, light hearted fiction…I could keep going. Some things that feed my soul are cooking, eating from our garden, transforming spaces in my home into something lovely and authentic, and watching my children in all their many stages. What I would like to get out of this is provoked thoughts, a different point of view (or the same!) I want to find myself pondering when I’m not reading the book. And, of course, the experience of knowing you are all reading the same thing! I just read ‘Bread & Wine’ and a book by Timothy Keller which I love. I love writing too and enjoy interviewing couples about their marriages for my blog, so any books about writing/language would interest me too. P&H – Simplicity Parenting*, An Everlasting Meal, The One-In-A-Million Boy (+ Green Kitchen Travels – by David Frenkiel). Hello there! My name is Caity. I am currently living in Texas and I love to read theology, creative nonfiction, and Flannery O’Connor. My soul is fed through spending time with others and learning their stories. I love each of these categories because the common theme seems to be the fostering of relationship – with our families, with ourselves, and with nature. My suggestion is The Supper of the Lamb by Robert Farrar Capon. My name is Jennifer, and I’m finishing my PhD in English literature at the University of Iowa. I love reading and am looking forward to reading for fun again after I finish my dissertation this spring. I’m open to forums, journal questions—you name it! NO-DRAMA DISCIPLINE: THE WHOLE-BRAIN WAY TO CALM THE CHAOS AND NURTURE YOUR CHILD’S DEVELOPMENT by Daniel J. Siegel | 288 pgs. Hi! I’m Meggie. I’m a graphic designer & stay at home mom. My husband & I, along with our 8 month old son call New York State home. I am a sucker for a good love story (The Notebook will forever be my favorite). I am so open to reading just about anything though & really enjoy being introduced to books that normally wouldn’t catch my eye. I love the idea of journal prompts, but open forum discussions would be great as well! I look so forward to diving into one of these books & connecting with other sweet mothers! First off, what a beautifully curated list! I want to dive into every single book and could not be more excited to start! I am an interior designer turned stay at home mom to my 2 beautiful girls ages 3 and 8 months. We live in San Diego, Ca. I love all things creative and am actually trying to bring more creativity back into my life. Reading has always been a huge part of what fills me up. I am an only child, so books somewhat served as my siblings! I love all books, but depending on where I am at I enjoy cozy mysteries, historical fiction and memoir’s. Cannot wait to begin! I don’t have much to add but, I ordered Simplicity Parenting Wednesday and it is due to arrive today! 1. Hi, I’m Caitlin, and I love this idea! I’m from KC, I work for a big corp as a tech writer by day, and I am an avid reader and occasional blogger by night. Rising Strong: The Reckoning. The Rumble. The Revolution., Brene Brown. 3. I don’t think that I need an accountability system. I don’t have kids yet, so I have time to read every day 🙂 But I am totally willing to participate to keep others accountable. I love the idea of journal questions! Despite the fact that I’ve always been a reader and spent 9 years teaching English, I haven’t done a whole lot of reading over the past two years. That said, I actually *just* checked out Simplicity Parenting from the library, and I started it last night. I’ve typically enjoyed reading historical fiction and fantasy (The All Soul’s Trilogy is the best of both worlds, I think), but lately, I’ve found myself drawn to personal narratives, sometime I used never to enjoy. As far as accountability, I can’t say, though both of your suggestions sound completely reasonable. Hi!! I am so excited about this idea! I am open to any of the books listed, most excited for the category of parenthood and homemaking! I typically reach for inspirational books like ‘Bread and Wine’ by Shauna Niequest. Currently reading ‘Present Over Perfect’ and in my pumping bag I just started ‘Bird by Bird’! I can’t wait for this, so excited! 1. My name is Libby, I’m a student midwife in England. I love to read any and every fiction book, nature books and anything related to childbirth. 3. What will help me stay accountable would probably be encouraging posts and the prompt of journal questions. Hello, and thank you so much for putting this together. I admire the options you’ve given here and I’ve added many titles to my TBR list from the commenters as well. Does anyone listen to the podcast What Should I Read Next with the blogger Modern Mrs. Darcy? Some of it is not my cup of tea, but I really enjoy hearing Anne and her guests talk about books. My name is Jackie and I have 3 sweet sons: Van, 5 1/2; Bowie 3 3/4; and Jude 13 months. I want a daughter so badly, but not sure if it’s the cards. I was a writer and cookbook editor in NYC/NJ for almost ten years and recently switched over to Waldorf early childhood education. My family just moved to Baltimore where I am a Parent Child teacher at the city’s Waldorf school where my oldest attends kindergarten. I love to read EVERYTHING, seriously. I didn’t read much for a few years, I think, in the early years of having children, but now I’m back at it. I love fiction, non-fiction, parenting books, self-help-ish books, political, YA, all of it. I just finished Zadie Smith’s Swing Time, which I liked more than I’d expected to; Elif Shafak’s Honor, which is SOOO good; and a middle grade novel, Wolf Hall. I’m currently reading They Can’t Kill Us All: Ferguson, Baltimore, and a New Era in America’s Racial Justice Movement; Alain de Botton’s The Course of Love; Heaven on Earth; and Mary Oliver’s Why I Wake Early. The library is definitely one of my favorite places on the planet. OK, moving on before this turns into a novel itself! I love book clubs and lately have been disappointed with my local ones that cancel meetings last minute. Simply put: I just want to read good books and discuss them with people. Gain some new perspectives. Hear about people’s stories and experiences. Feel not quite so alone! Moving is tough. Being a SAHM most days, while containing splendor and joy, can also be so lonely and monotonous. My name is Madalyn. Minnesota is my home and i am a SAHM and also homeschool my three boys ages 11, 8, 4 1/2. I love to read your blog, and I think I’d be okay trying any book on this list. I am an INFJ, and reading is really important to me. Its something I don’t do enough of, and that’s why I think this is a great opportunity! One book that I am planning to read soon is Floret Flower’s “Cut Flower Garden.” I pre-order it as it doesn’t officially come out until the 7th, I believe. But other than that, I’d love to add some book club books in as well. The couple I did see on the list that really grab my attention was The Everlasting Meal, and The Life of Trees. Sorry this isn’t exactly what you asked for but I hope it does help. Oh goodness, I am so excited you’ve reached out with this book club idea! I too am a busy mom who loves to read but meeting in person can be like jumping through hoops with a toddler. My name is Chelsey and I am a stay at home mom to a spirited little woman called Gwynneth, expecting another in November. I love to garden, listen to podcasts, and be outside. I love to read anything that challenges my way of thinking or believing in deep ways, bringing things to the surface; forcing me to confront. 1. Ohhh, this is going to be awesome! You have a great list & a lot going on in the comments! I have read a few of these suggestions, but would definitely be open to reading again, esp given the opportunity for discussion. I’ve already gone ahead and put most of these on hold at the library.. . I’m Brianna. I’m still very much figuring things out. After grad school, I jumped ship from a photography company in South Carolina to a soap making factory in KC. We are just a skip away from you down in OP. I currently stay at home with my two-year-old wide eyed, silly boy. Mothering has been quite the shift for me, as he was far from planned & hardly stops moving. I love to read and write, but struggle making time for myself, so this is just the motivation I need. I mainly read creative nonfiction. Memoirs, travel essays, cook books/food related, parenting, teaching methods/Montessori. An Everlasting Meal*, A Homemade Life, No-Drama Discipline (I’ve been trying to get through this one, even have it as an audio book. I can tell it’s worthy of reading, but need that kick in the pants to stay dedicated to it) My addition: Whole Child/Whole Parent by Polly Berrien Berends. I love the idea of the book club and would love to be involved. The books you have chosen are amazing and the quote you used reminded me I’ve been meaning to read Bird by Bird – about to hop into bed and start reading! I am Kate, a young adult on the brink of becoming a wife, and hopefully a mother. I love to read about ways that I can bring peace into my life, because it can be absolutely insane sometimes (college, full-time job, relationships, etc!). I also find satire and labels to be comforting as well, because you are stepping out of the real-world for a moment, but still opening your mind to ideas and commentary. I think rather than being kept accountable per say, a place where we can come together maybe once a week or so and discuss what we have read that week and how it impacted us would be so nice. Thank you Amanda for this great community you have created! It is completely inspiring to me to be able to look forward and see that it is possible to create an intentional life, even if you are in the early stages of it like I am. -my choice- Yoga for Children by Lisa Flynn with a kids book added to that called Peaceful Piggy Meditation (so cute!). Hello! I’m Natalia. A mom to beautiful baby girl, a wife, a knitter and lover of all things crafty. I’m from Vancouver, Canada. Excited about this book club.. Simplicity Parenting by Kim John Payne | 256 pgs. *An Everlasting Meal: Cooking with Economy and Grace by Tamar Adler | 272 pgs. The One-in-a-Million Boy by Monica Wood | 336 pgs. The Broken Way: A Daring Path into the Abundant Life by Ann Voskamp | 288 pgs. H is for Hawk by Helen MacDonald | 320 pgs. *The Hidden Life of Trees: What They Feel, How They Communicate—Discoveries from a Secret World by Peter Wohlleben | 288 pgs. Hi. My name is Camille, 25, from Lafayette Louisiana. Momma to 3yr old Hudson Rowan. I am the secretary for a big home health company here in town. I’m a mother of three (Harper 7, Everson 5 and Alfie 13mths) and live in a small country town in Australia. I am a Secondary School Teacher who at the moment is all about simplifying our life. Your blog often gives me so much wonderful inspiration and I thank you for allowing us to have a glimpse into your world. Journal questions or open forums sound fabulous to me and would be happy to do either or both! 1. My name is Lissa. I am 30 years old, am a program director for a nonprofit working with refugees and immigrants, and I am a wife. I mostly love reading non-fiction – anything about the body, health, spirituality, parenting (even though I’m not one), or memoirs. But, I’m trying to love novels. I am very excited that you are starting a book club 🙂 My name is Chelsea. I am a stay at home mother and first time mum. I am also a freelance dance artist and dance teacher. I love to read many different types of books- love stories, engaging stories with lots of plot twists, parenting, self-help, housekeeping, inspirational… I enjoy a range of topics. I would love for this to get me reading more again. I’d like to spend more time reading books than checking my social media. I also have a hard time finding books that I truly enjoy on my own. If they don’t grasp me right away then I get bored… I feel that I miss out on a lot of great books because of this. So I would love to be part of the discussion about these books. Journal questions would be fun too! Just a way to check in with everyone and feel involved. I’ve been following this blog for a while and I think this is a great idea. I love reading and this book club looks like what I need. What an awesome opportunity to discover great reads! -The hidden life of trees*, The broken way, H is for Hawk. Hello! I am a mom of 2 girls (ages 3 and almost 2) and due with our 3rd babe in June! I have always loved to read, something my mom and dad passed down to me, but finding time…should I say making time, for reading has been tough. I have set a personal goal of 2 books per month- usually 1 fiction and 1 non fiction- but I know this book club will help keep me accountable. 1. SIMPLICITY PARENTING by Kim John Payne | 256 pgs. 2. ***NO-DRAMA DISCIPLINE: THE WHOLE-BRAIN WAY TO CALM THE CHAOS AND NURTURE YOUR CHILD’S DEVELOPMENT by Daniel J. Siegel | 288 pgs. 3. A HOMEMADE LIFE: STORIES AND RECIPES FROM MY KITCHEN TABLE by Molly Wizenberg | 352 pgs. 1. HOPE IN THE DARK: UNTOLD HISTORIES, WILD POSSIBILITIES by Rebecca Solnit | 184 pgs. 2. THE BOOK OF SHE: YOUR HEROINE’S JOURNEY INTO THE HEART OF FEMININE POWER by Sara Avant Stover | 320 pgs. 3. ***THE ABUNDANCE: NARRATIVE ESSAYS OLD & NEW by Annie Dillard | 304 pgs. 1. ***THE BROKEN WAY: A DARING PATH INTO THE ABUNDANT LIFE by Ann Voskamp | 288 pgs. 2. UPSTREAM by Mary Oliver | 178 pgs. 3. ON THE MOVE: A LIFE by Oliver Sacks | 416 pgs. Hello! My name is Kate, I live in Australia and work as a freelance writer and photographer. I don’t have children but do have a sweet grey cat named Hazel. In terms of books, I am open to reading just about anything but have a special place in my heart for poetry, history and beautiful writings about food (think Nigel Slater). My additional choice would be Do Not Say We Have Nothing by Madeleine Thien – it is at the top of my library cue. Oh I’m really excited about this! I’ve been keen to join a book club but just havent been able to find the time. I’m an Early Childhood Educator with an MSc in Applied Child Psychology so I tend to read a lot around the topic of child development. I’m a new mama to a 2 month old little girl so I’ve thrown a lot of parenting books into the mix recently. I love books that give me insight into the way others live and give me something to aspire to. I enjoy anything that inspires a slow, simple and sustainable way of living. I’ve been wanting to read Simplicity Parenting* for a while now but I’d be happy to pick up any of the books listed. The Book of She and The Abundance jump out at me. Hello, my name is Jenny. I am so excited to be apart of this. I have never committed to a book club or commented on a blog, but this sounds right up my alley. I am a momma to a 21 month old baby girl, Molly, and I am special education teacher to middle schoolers. I love to read about family and nature. Here is my list. My name is Alexis and I live in New Hampshire. I am a mom to two teenage boys but was a stay at home mom for the first 7 years of their lives. I am really excited about this book club and look forward to discussions on all these wonderful titles! One book I would like to read this year is “Bringing up Bebe” by Pamela Duckerman. I started it when I was pregnant with my daughter and really enjoyed the first half and have been meaning to finish it ever since! Ps-thank you for all of your work here! Hello. Amanda, thank you for starting this book club. I admire both your kind heart and energy! I am a stay at home mum from Australia and live with my husband and our two boys who are 6 and 4. All the books sound worthy but these stood out the most – Simplicty Parenting, An Everlasting Meal, The Lonely City, Hope in the Dark, The Broken Way and The Hidden Life of Trees. So excited for this! I’m a stay to home mama to our 16-month-old daughter. We live in Alaska, love to live as natural as we can and spend a great deal of our time outdoors exploring. I used to love to read and spent many hours on end doing so, but since becoming a momma I can’t seem to, “find the time” but I’m ready to start making time for myself and for reading again. So this seems like the perfect start! Mama to a 3 year old girl and 1 year old boy. I love reading, but have really fallen behind since becoming a mother. I love all sorts of books, but books on parenting and self development are my top areas of interest right now. Thank you so much for setting this up! My name is Stefanie. I was born and grew up in Quito, Ecuador where my parents were and still are missionaries. I came back to the states on a soccer scholarship for college and stayed in Kansas City all these years. I work for a non-profit working in international child development. I love my coworkers and the purpose for the work that I do, even though it is often times sitting at a desk. I am married to a wonderful man whom I met her in KC and we have a beautiful little boy named Charles Atlas (1 1/2 years old). I didn’t know about the body builder named Charles Atlas when we named him after my grandfather. Oops! I am very excited about your bookclub and have enjoyed reading your blog these past few years. I am looking forward to connecting through the sharing and reading of these books. I just love to read, I feel like I don’t take enough time to do it. A few years ago when Borders went out of business I have to say I went a little crazy and bought all kinds of books. Some I have read other are still waiting on my shelf for me to dive in. This is just the push I need. I would be fine with reading any of these, as I know you have taken the time to pick them especially for this group. I love the idea of questions and open discussion through your blog. I think you made it easy 10 pages a day, when you break it down that way anyone can do it ; ) I think the main thing I want to get out of this book is camaraderie and support as a mother and friend. So many of my lovely mother friends are younger and moving out to the suburbs and it feels like they are moving on a bit, whereas my closest friends I grew up with are all spread out across the US. So I guess in a way I am looking for inclusion, encouragement as I take on this thing called motherhood and life. I also have always just wanted to do a bookclub and what better way then with a fellow group of woman on the same journey! Thank you so much for your words and heart shared so vulnerably here. 1. I am also a lover of books. I am a high school history teacher at an independent school in Baltimore, and mom to three young children, including a 7 month baby. I love to balance fiction and non-fiction, depending on whether I need to escape/nurture or if I’m curious about learning something completely new. My favorite genre (perhaps no surprise) is a combo– historical fiction! I am Zasha from NJ and I am very excited to join this book club. – thanks for organizing it. I was a literature teacher for 13 years but bow i am lucky to be a stay at home mommy to my 3 kiddos — 13 yo Nico , 3 yo Sofia and my almost 2 Noah. I am also a part time yoga teacher ; I love reading everything and I’m looking forward to any of the titles from your list. My all time favorite thing to read is anything by Ralph Waldo Emerson – I go back to his writing and it always leads to amazing reflection. I think journal questions or forum discussions sound cool ! Hello there! My name is Amy. I’m a follower of Jesus, a lover of simplicity, living a slow life in our old creaky farmhouse. I’m a former nurse turned stay at home mama to my darling 4 month old twins, Odette and Everett. I’m beyond excited for this book club, what a treat! I enjoy reading a variety of books,from the inspirational to nutritional studies and so much in between. In all honesty I have yet to put any books in my basket for the year. The list of books you’ve compiled above sounds like just the ticket! I think both journal questions and open forum discussions would be great! This book club will allow for some much needed “me time”. Really getting the chance to dig into these books and get to understand so many different view points is exciting. So excited for this! I always love your book recommendations! I am a stay at home mama to twin girls, homesteading on our little property in Montana. Things that feed my soul: “me too” moments, good books, time with family, time with God, good books, music, nature. Hello! My name is Tara and work full-time as the Photography Collection Manager at the Nelson-Atkins Museum of Art in KC. I have two kids (ages 6 and 3) and would love to be a part of a book club that gets me back into reading again! I’m a momma to two kids (6 and 3), full time working mom, lover of all your blog and yearning for a more simple, quiet, intentional life. I am a momma of two. Beautiful kind boy(3) and adorable sassy girl (1). I currently live in a small rural town in North Central KS. I commute daily to a larger city where I work with kiddos ages 0-3 and their parents (Parents As Teachers). In short I educate parents, screen kiddos, and help build strong families. I too love the simple life which is why my family has chosen to commute to a small rural town daily. I simply love rural living. As a working mom I struggle with fitting everything I need to into one day, but I love it al the same. Hi Amanda! My name is Carli and I am a stay at home mama to two girls (Navy (2) and Willa (4 months)). I also work from home, part time, in marketing, branding & communications. Reading books on wholesome living, spirit/nature, whole-hearted living (just finished the Gift of Imperfection and wholehearted was Brene Brown’s word…loved it) all feed my soul. I love books that are visceral, uplifting, gently in their delivery but urgent in their message. 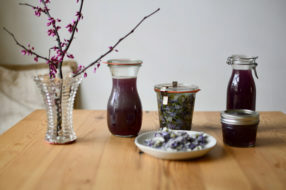 The topics that most engage my heart and mind presently are intentional mothering, essential self care, nourishing food/food practices, present parenting and the practice of gratitude. Thank you so much for initiating this book club! I can’t wait! My book choices are as follows: Simplicty Parenting*, No Drama Discipline and Tender at the Bone; Hope in the Dark, Book of She*, and The Abundance; Upstream*, The Hidden Life of Trees and The Broken Way. My choices for each category are Home Grown by Ben Hewitt (Parenting & Homemaking), Big Magic by Elizabeth Gilbert (Creativity & the Art of Wholesome Living), and The Compassionate Instinct edited by Dacher Kilter, Jason Marsh, and Jeremy Adam Smith (Spirit & Nature). Hi! So looking forward to this. I’m Rachel, and I stay home with my three year old and work as a potter out of my garage studio. I love cookbooks, and of course I could read Harry Potter a hundred more times. I have the illustrated copies and read them to my son, and at least one of us loves it. Carving out time to follow whatever creative passion I’m feeling that day is important to me, which can be difficult to do sometimes with a toddler at home. I’d love to read a book for creatives, maybe ways to include your children. Hello! My name is Meagan. I was born in NC and lived there for 25 years, then moved to Switzerland and now to India with my husband and cat. I never thought I would be an “expat wife,” but here I am! I am a chemical engineer by degree, spent 7 years climbing the corporate ladder before I quit. And now I have a one month old baby boy named Sterling. I am pursing a new career in Feldenkrais (mind body education) because it changed my life some years ago! I haven’t had a chance to think much about reading yet this year, but I’ve been wanting to read The Goldfinch for over a year! Still sitting on my bedside table…. Hello! My name is Emily, California lover, and I am a full time, joyful nanny, and have dreams of becoming an RN. I love to read anything I can get my hands on and am a passionate scribbler, page folder, and book lender. I enjoy learning about child raising and teaching and have dreams of being a wonderful mother one day. I love being outdoors, feeling sunshine, and am a true introvert. I am Dietra and would love to read along! which will be a great reminder to reread! I’m so looking forward to being part of this book club. I am a doctoral student in Rhetoric and Composition (defending my dissertation by the end of the year… I hope), and I live in Wisconsin with my husband, our nine month old daughter, and two cats. What feeds my soul? Reading… writing… riding my bicycle… running… music… warm, sunny beach days… I also love teaching and working with undergraduate students — their energy and optimism and zest for life is contagious. My name is Stephanie. I’m a language teacher. And a writer. Although I teach more than I write. At the moment I read even less than I write. During my first pregnancy I read a lot lot lot. So now that I’m pregnant for the second time, I thought it would be a great opportunity to pick up this habit again. I like to read books (mostly fiction) that challenges my imagination and give me new perceptions. To answer your questions, I guess journal questions and an open forum would keep me motivated, perhaps posting mini blogs with a set hashtag as well. I’m really looking forward to this. Hi! I am Liz, momma to two wonderful children (2 and 2 months). I am a stay at home mom who lives in Texas. I am a huge fan of book and reading. I always feel better when I am in the middle of a book. But lately, I have not been reading as much as I would like (as in almost never). I love that this book journey is happening to get me reading again and to hopefully hold me accountable for my part. I find my soul refreshes by spending quality time with my people, drinking coffee or tea, reading an engrossing book, taking ballet classes, and spending time in God’s word. i’m late commenting on this post but i’ve been keeping my ears pricked to amanda’s bookclub idea for a while and i’m so excited to get started! 1. i’m sarah, stay at home mama to my 10 month old son and wife to my german hubby. we live in the palatinate area of germany but are moving to paris in may for three years for my husband’s work. 2. i didn’t participate in the book selection but all of these look wonderful! i’m particularly excited about the first one and the one by ann voskamp (i’m working on 1000 gifts right now). i adore minimal living and have already noticed that it’s changed my life significantly since last year when i decided to try to break the addiction of consumerism and be more mindful about day to day living. I know I am a little late to this..
Hello! I am late to the game, but wanted to say hi, and thank you for hosting this lovely book club. I am a HUGE reader, and need a little direction currently, so this is great timing for me. I am a mom to three young children, and I work for Beautycounter – helping to educate women about what goes into personal care products, and helping them make safe choices for their families. I love to read almost anything – but especially non fiction, history, and historical fiction. No preference with the other categories. All look very interesting. Thanks again, and look forward to digging into these reads along with you and this community! I’m Holly, a 27-year-old from Jacksonville, Florida. I’ve been married to my husband Josh for almost 3 years. I recently became a SAHM to my 18 month old girl, Branch Eisley. The past few books I have read were geared towards marriage, so I am excited to hopefully join you all and switch things up a bit, digging into the categories you’ve selected. I’m totally up for the journal questions and discussion questions! I often feel a longing for that sense of learning like I had back in college, so I love this, and there is just something about going through these in a structured way & alongside others that I find exciting. The ultimate goal for me is to dive into these and better myself in these areas of my life, and through participating with others I hope to inspire someone else and to be inspired! Hello – my name is Alisha and I am living in beautiful Montana. I am a wife and mama to 4 kids – 14, 8, 6, and 3 and hitting every developmental stage currently haha! I love natural health and science, research, non profit work, stories of triumph, deep conversations, good laughs accompanying good food, baking, art, and slow days at home with my family. All the books sound great and I will read any of them happily – though I will admit to reading 3 books at once and having hard time finishing certain ones. I take an artistic approach to reading I guess and read when the mood strikes. So I am looking forward to a format with some questions or prompts to keep me to the end of the book. I would love to read Big Magic by Elizabeth Gilbert, Rob Bells newest book, and I am Malala an autobiography. I am really looking forward to joining this book club. A mama of two rambunctious little ones I crave some quality literature. Honestly the book list looks wonderful and I’d like to read them all. I hope I’m not too late!! I just found your Instagram account and that led to your beautiful blog and I am so excited about this book club I had to post! I am a stay at home mama to two wonderful boys- 4 years old and 14 months old. We live in Arizona where it’s hot and dusty but we have beautiful sunsets! I am, as I am learning all moms are, struggling to put self care on my priority list and reading was something I decided had to be done. For me. I used to read 3-4 books a week before having my first son and then after the birth of my second son I stopped altogether… which I had hardly been reading after the birth of my first son. I missed it so and I am excited to put this at the top of my priority list! I just spent all of my quiet time at nap going through each title- wow! Hard to find favorites! I would love to read them all! *Simplicity Parenting, The one in a Million Boy, A Life at the Table. I would love to read The Awakened Parent and The Awakened Family – I saw those both were also suggested in comments! So exciting! *The book of SHE, The Lonely City, The View from the Cheap Seats. *The Life of Trees(I see that’s started so I’m on my way to the library today!) , On the Move, The Broken Way! I would love a forum to discuss or chat! I am Danie Gohr and I am the Founder of Catch This Mama. We are creating a book club over there as well. So, I love to be enriched in multiple facets with many different people who come from every place in life. I am a Mama to 3 beautiful girls and live in the heart of Iowa. Hi! Thanks for your lovely blog & inspiration. Hoping to join your book club! Is that still happening?! If so, I’d love to jump in.